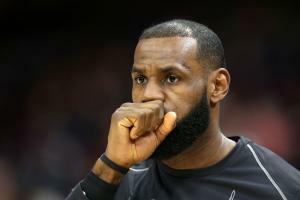 Jan. 20 (UPI) — New York Knicks big man Enes Kanter dissed LeBron James on Twitter Saturday, after the Cleveland Cavaliers suffered a brutal loss. James’ Cavaliers fell 148-124 to the Oklahoma City Thunder at Quicken Loans Arena in Cleveland. “148. #StriveForGreatness,” Kanter tweeted after seeing the result of the game. Kanter, 25, played for the Thunder for three years, before joining the Knicks this offseason. The seven-year veteran has averaged 11.5 points and seven rebounds per game during his career and has never made an All-Star team. The Kanter tweet included emojis of a rocket ship, king’s crown and lightning bolt. James uses those same emojis in nearly all of his tweets. Saturday’s defensive performance was a new low for the struggling Cavaliers. The 148 points surrendered were tied for the most allowed in franchise history. Cleveland has lost five of their last six games. The James and Kanter feud sparked in November, after James said that the Knicks should have drafted Dennis Smith Jr. instead of Frank Ntilikina. Kanter later stood up for his teammate and the two got into a shoving match during their matchup at Madison Square Garden. James retorted by calling Kanter’s comments corny and said that he is the king, his daughter is the princess and his wife is the queen. The Cavaliers face the San Antonio Spurs at 8 p.m. Tuesday at the AT&T Center in San Antonio.